I finally had the opportunity to visit Cuthbert, GA (pop. 3,500) in Randolph County last week. Bright orange soil, pecan farms (I thought they were neatly planted Oak trees at first), and peanuts – the deep south for sure, Cuthbert sits in the Southwest corner of Georgia near the Alabama line. At the center of town is a large roundabout – in the center of the roundabout, a small park is dominated by a tall statue honoring the soldiers of the Confederate Army. Twenty miles from Plains, Georgia, Cuthbert could boast that W. A. Carter, President Jimmy’s grandfather, was buried here in 1903 – but no fuss is made. The town is somewhat isolated today, but at the time our Howell’s lived here Cuthbert was on the main railway lines to Atlanta, and Savannah. Newspaper ads of the day promoted taking the train to Tybee Beach near Savannah for a summer vacation. Cuthbert was also the migratory home of Emma Heard Howell, and at least five of her children including our own Great Grandfather Henry Alonzo Howell. Older brother John Johnson Howell becomes the proprietor of “The Cuthbert Leader” a local newspaperin January, 1902. 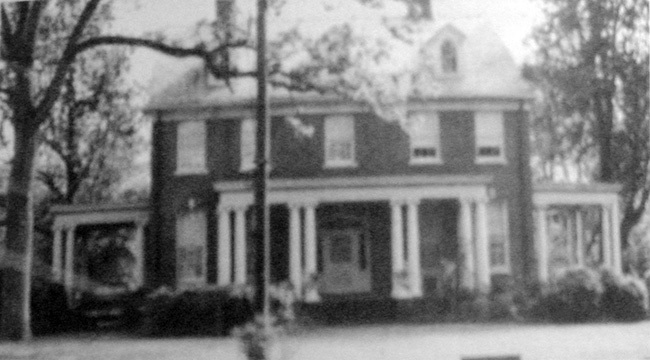 Four of Emma’s children (Henry Alonzo Howell, Edward Lathrop Howell, Mildred Eva Howell, and Bertha Howell Camp) in the 1920’s lived as adults in the same house on 707 Lumpkin Street in Cuthbert. The youngest of the family, Edward Lathrop Howell moves to Cuthbert, plays professional baseball as “Kid Powell”, was a pianist for silent movies and then becomes the publisher of the newspaper. He writes editorials under the not-so-secret pen name “Ed Gussick” – prominently appearing on his headstone in White Plains. What initially brought the Howell’s 200 miles to Cuthbert from White Plains, Georgia in the first place is unknown to me. The picture of the family that emerges here is one of a close knit group that were deeply involved in the community as piano & music teachers, church organists, and as the owners, editors and writers of the local newspaper. They lived much of their lives here, and returned to White Plains only to be buried with their relatives.